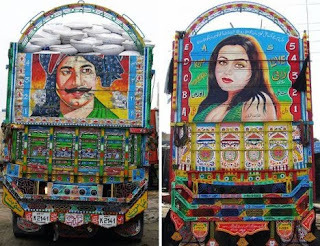 Apparently, this is one of the most popular art forms in Pakistan, as well as other parts of the world. Similar techniques and materials are employed in truck and (more frequently) bus decoration in the Philippines, Indonesia and several countries in Central and South America; in South Asia itself, Indian trucks are painted, as are the bicycle rickshaws of Bangladesh. What makes the case of Pakistan unusual, however, is the pervasiveness of vehicle decoration, since decoration is heavily used on virtually all private and fleet-owned commercial vehicles, from the well-known trucks and buses to vans, share taxis, animal carts and even juice vendors’ pushcarts (a circumstance shared only by Afghanistan).